“If you ask me today, is it possible to live to be 500? The answer is yes,” Bill Maris says one January afternoon in Mountain View, California. The president and managing partner ofGoogle Ventures just turned 40, but he looks more like a 19-year-old college kid at midterm. He’s wearing sneakers and a gray denim shirt over a T-shirt; it looks like he hasn’t shaved in a few days. Behind him, sun is streaming through a large wall of windows. Beyond is the leafy expanse of the main Google campus. Inside his office, there’s not much that gives any indication of the work Maris does here, Bloomberg Markets will report in its April 2015 issue. The room is sparse—clean white walls, a few chairs, a table. On this day, his desk has no papers, no notepads or Post-its, not even a computer. Here’s where you really figure out who Bill Maris is: on his bookshelf. There’s a fat text called Molecular Biotechnology: Principles and Applications of Recombinant DNA. There’s a well-read copy of Biotechnology: Applying the Genetic Revolution. And a collection of illustrations by Fritz Kahn, a German physician who was among the first to depict the human body as a machine. Wedged among these is a book that particularly stands out to anyone interested in living to 500. The Singularity Is Near: When Humans Transcend Biology, published in 2005, is the seminal work by futurist Ray Kurzweil. He famously predicted that in 2045, humankind will have its Terminator moment: The rise of computers will outpace our ability to control them. To keep up, we will radically transform our biology via nanobots and other machines that will enhance our anatomy and our DNA, changing everything about how we live and die. “It will liberate us from our own limitations,” says Maris, who studied neuroscience at Middlebury College and once worked in a biomedical lab at Duke University. Kurzweil is a friend. Google hired him to help Maris and other Googlers understand a world in which machines surpass human biology. This might be a terrifying, dystopian future to some. To Maris, it’s business. Maris is an unusual guy with an unusual job. Seven years ago, Sergey Brin and Larry Page, the founders of Google, tapped him to start a venture capital fund, putting him smack between those tech titans and the sea of ambitious entrepreneurs trying to be just like them. At the time, he was a young entrepreneur himself, with limited investing experience and no clout in Silicon Valley. He’d sold his Vermont-based Web-hosting company and was working at a nonprofit, developing technology for cataract blindness in India. This made him exactly the kind of outsider Google was looking for. “Bill was ready to come at this from an entirely new perspective,” says David Drummond, who, as Google’s chief legal officer and senior vice president of corporate development, oversees Google Ventures as well as the company’s other investment vehicles. 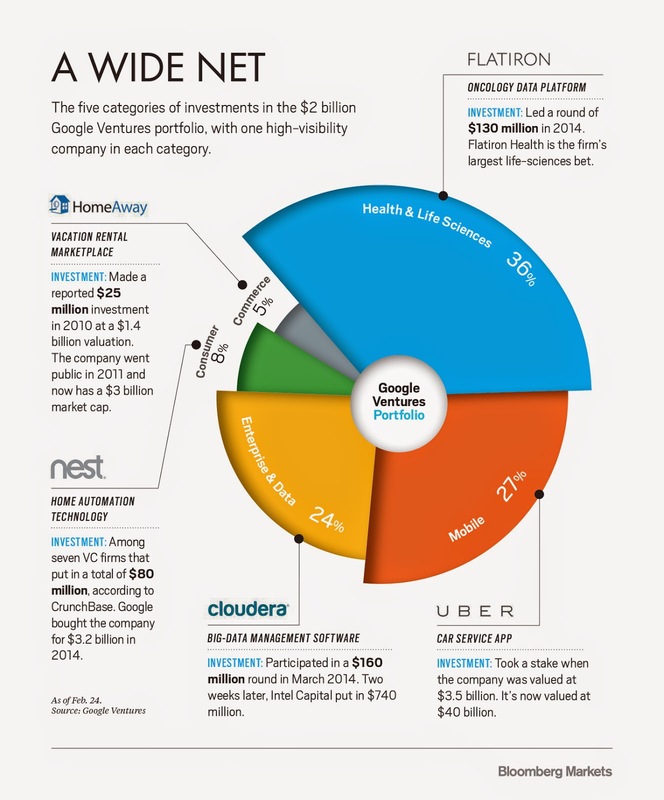 Google Ventures has close to $2 billion in assets under management, with stakes in more than 280 startups. Each year, Google gives Maris $300 million in new capital, and this year he’ll have an extra $125 million to invest in a new European fund. That puts Google Ventures on a financial par with Silicon Valley’s biggest venture firms, which typically put to work $300 million to $500 million a year. According to data compiled by CB Insights, a research firm that tracks venture capital activity, Google Ventures was the fourth-most-active venture firm in the U.S. last year, participating in 87 deals. Google puts huge resources into looking for what’s coming next. It spends millions on projects like Google X, the internal lab that developed Google Glass and is working on driverless cars. In January, the company made a $900 million investment in Elon Musk’sSpaceX. 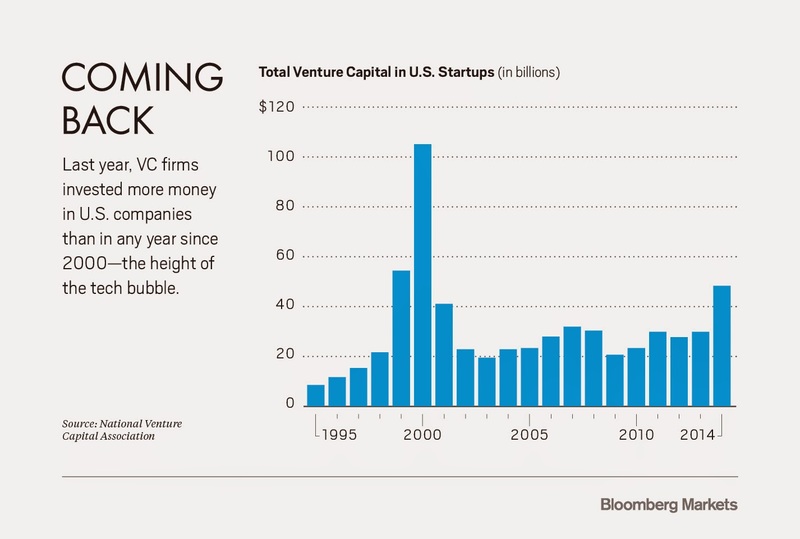 In 2014, it started Google Capital to invest in later-stage technology companies. Maris’s views on the intersection of technology and medicine fit in well here: Google has spent hundreds of millions of dollars backing a research center, called Calico, to study how to reverse aging, and Google X is working on a pill that would insert nanoparticles into our bloodstream to detect disease and cancer mutations. Maris has a peculiar position in the Googlesphere. He’s a part of it, but also free from it. Google Ventures is set up differently than most other in-house corporate venture funds—Intel Capital, Verizon Ventures, and the like. The firm makes its investments independent of its parent’s corporate strategy. It can back any company it wants, whether or not it fits with Google’s plans. The fund also can sell its stakes to whomever it wants, including Google competitors. Facebook and Yahoo have bought startups funded by Google Ventures. With Google’s money and clout behind him, Maris has a huge amount of freedom. He can, and does, go after Silicon Valley’s most-sought-after startups. Uber, Nest, and Cloudera are among the firm’s big wins. Maris doesn’t intend to stop pursuing these kinds of deals. But he has other ambitions, too. “There are plenty of people, including us, that want to invest in consumer Internet, but we can do more than that,” he says. He now has 36 percent of the fund’s assets invested in life sciences, up from 6 percent in 2013. Maris is standing at the front of Joshua Tree, Google Ventures’ large conference room. Each room at headquarters is named after a national park. “OK, we have a lot to get through today,” he tells his staff. The group meets here biweekly to talk about prospects and strategy. Maris has a team of 70, most of whom are in the room this day or patched in by phone or video. The group includes the fund’s 17 investing partners, who are in charge of finding startups. Among the investing partners are Joe Kraus, co-founder of Excite; Rich Miner, co-founder of Android; and David Krane, employee No. 84 at Google. The mood in the room is casual. Some staffers sit cross-legged on the floor; others curl up on soft felt couches. There are a lot of jokes. One partner starts his presentation with a slide entitled “Secret Project”—which most people in the room already know about—and concludes it with a doctored-up photo of Maris’s head superimposed on the body of someone playing tambourine. It’s a jab at the boss, who married the singer-songwriterTristan Prettyman last August and recently went on tour with her. Everyone laughs. Maris smiles, but immediately he’s back to business. “Time is the one thing I can’t get back and can’t give back to you,” he says, turning to an agenda on the screen behind him. “I know you’re all aware of the conference happening this week,” Maris says. An hour away in San Francisco, JPMorgan Chase is hosting its annual health-care confab, nicknamed the Super Bowl of Health Care. Thousands of pharmaceutical executives and investors have gathered for what has become a huge part of the industry’s dealmaking. Most of Google Ventures’ life sciences startups are attending. One, Foundation Medicine, which uses genetic data to create diagnostic oncology tools, is generating huge buzz this year. In January, Roche Holding announced plans to take a majority stake in the company, in a transaction valued at $1 billion. The stock more than doubled the next day. 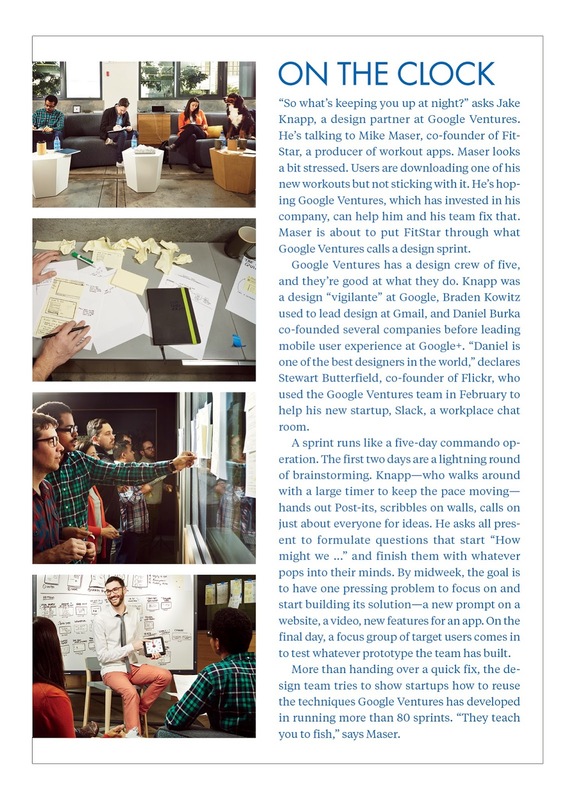 Google Ventures has a 4 percent stake in the company. When Google Ventures invested in Foundation in 2011, the company’s promise was mostly theoretical. The world was still waiting for the breakthroughs that have seemed inevitable ever since scientists first mapped the human genome in 2003. Foundation’s team included eminent geneticists, including Eric Lander, one of the leaders of the Human Genome Project. Still, the company had no viable commercial product. Identifying promising life sciences companies isn’t like hunting around Silicon Valley for coders with a cool app. Biotech companies are built around complicated science. They require millions of dollars in investments, partnerships with big pharma companies, and lengthy clinical trials. To help with his hunt, Maris has brought in scientists as partners. One, Dr. Krishna Yeshwant, a Harvard- and Stanford-trained doctor, still works in a clinic twice a week in Boston, where he is based. Last year, he led the firm’s biggest bet in life sciences, an investment in Flatiron Health, which is building a cloud platform to analyze cancer data. At the age of 22, just out of college, Maris met the friend who would lead him to Google. It was 1997: Yahoo was search, AOL was e-mail, Google was called BackRub. Maris was in New York, working at Investor AB, a Swedish investing firm. He didn’t care for Wall Street, but he did like the smart Yale grad sitting next to him. She told him about a company that was going to change the world. “I remember telling him about this new search engine my sister was working on, and he said, ‘Oh, Yahoo is good enough,’” recalls Anne Wojcicki, who would become the wife of Sergey Brin. Her sister Susan, one of Google’s earliest employees, is now CEO of YouTube. Anne Wojcicki went on to co-found 23andMe, a genetics testing company that is part of Google Ventures’ portfolio. Maris quit Investor AB after six months and went to Burlington, Vermont, to start a Web-hosting company. He was so green that he read Netscape and the World Wide Web for Dummies. He funded his company, Burlee, with his credit cards and by convincing the operators of the Lake Champlain ferry to invest. Maris sold Burlee to a company that became Web.com for an undisclosed sum in 2002. It wasn’t Google-level money, but it was enough for him to live on in Vermont with no job. He would have stayed there except that his old friend, Wojcicki, kept calling him West. Maris started visiting her and Brin, staying at their home in California. He increasingly became drawn into their sphere. “He and Larry and Sergey would be at dinner and start talking about, I don’t know, flying cars,” recalls Wojcicki. Maris spent six months researching venture capital around Silicon Valley. He traveled up and down Sand Hill Road, home to many of the Valley’s most prestigious VC firms, asking top investors for advice. At first, he had a hard time getting anyone to take him seriously. During one meeting, a VC started laughing at his idea for Google Ventures. Maris was told his fund would never work: VCs wouldn’t want Google looking over their shoulders. “There were some in the venture world who weren’t particularly welcoming to Bill or Google Ventures,” recalls John Doerr, a legendary partner at Kleiner Perkins Caufield & Byers, one of the most important first-generation California VC firms. Doerr, who sits on Google’s corporate board, advised Maris on setting up the venture fund. Around Silicon Valley, corporate venture funds have a bad reputation. “There is an inherent paradox to the notion of corporate venture,” says Bill Gurley, a general partner at the VC firm Benchmark Capital. The conflict is, do the fund’s loyalties lie with the startup or with the parent? Just about every independent venture capitalist in tech has stories of being burned by corporate funds. Either the company uses its venture investments to gather intelligence and ends up competing with the companies it funds or company management loses interest at some point and pulls out.